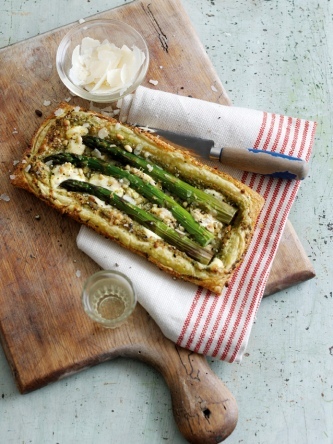 Enjoy this very simple and savoury Parmesan and Asparagus Tart recipe. Start by brushing rectangular pastry sheets with beaten egg and top with pesto, Parmigiano Reggiano and mascarpone cheese. Meanwhile, blanche asparagus and place the spears across the tart. Sprinkle over lemon zest and grated Parmigiano Reggiano and bake until golden brown. Serve with Parmigiano Reggiano shavings and basil for a fresh and flavoursome finish! Parmigiano Reggiano cheese, known as 'Parmesan', is one of the world's oldest and richest cheeses - still produced today as it was nine centuries ago. Totally natural - it's the only cheese that has such an extensive maturation which improves the nutrition, aroma and taste. The use of raw milk and the richness of natural ingredients make this cheese a unique and superior product - It takes 16 litres of milk to produce one kilogram of cheese! The minimum maturation time for Parmigiano Reggiano cheese is 12 months, but only when it reaches approximately 24 months of age, is it at its best. As well as having fantastic nutritional qualities, it's easy to digest and is high in calcium. Parmigiano Reggiano cheese is a PDO (Protected Designation of Origin) product. PDOs are defined and protected by European Union law in order to defend the reputation of regional foods. This mark ensures that Parmigiano Reggiano cheese can only be produced in designated areas of Parma, Reggio Emilia, Modena, Bologna to the west of the Reno River, and Mantua to the east of the Po River.